I'm new to Paint Party Friday, so I hope I have the right idea. I can smell a fresh breeze today, and this little painting seems to fit for the spring cleaning I ought to be doing. I posted this one's sister a while back. This one is also egg tempera and gold leaf, except on this one, I made the paint. Lovely painting! Beautiful colors! I can't believe you made them yourself. Bravo! Simply stunning...! I'd love to be her right now! Love it. Colors are awesome. Glad you hopped on board at PPF. Kristin and Eva are great hosts. Have fun and enjoy your blog hopping. Have a great weekend. 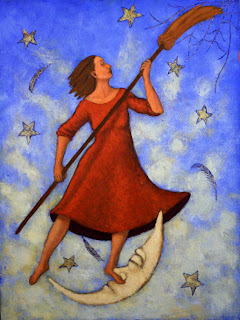 I Love your star sweeper..gorgeous enchanting and full of spirit. It makes me think of aura sweeping and creating harmony..beautiful work! She is gorgeous. Love the colors in this, I think you might be the first person I have run across that made their own paint, cool. this is wonderful. I clicked on it and was happy to see how large it is to take in all your lovely art, stepping on the moons nose, gold leaf... fun fun. Welcome to PPF! Welcome to PPF. I love this painting; it's just beautiful. This painting is toyally YUMMY, I love it, the richness of the colours, the feeling of freedom, FANTASTIC! OOH I love the colours and subject matter. Another area I would luv to learn.Your colours are gorgeous...lovely art work. Ahhhhhh I love this painting!!! I LOVE this piece and I can't believe you made the paint yourself- amazing! Gorgeous colors and movement and I love the pose you've placed her in. Really wonderful work! What a cute image; I can just see that as a big mural in a little girls room! Welcome to PPF! what a gorgeous image! I love the title as well. Welcome to the party (I'm a little late getting round everyone this week as I was on holiday til yesterday!) This has such a fairytale quality to it. Glad you joined Paint Party Friday! This is lovely. I especially like the moon! Great title, too. I'm crushin' on this! It's wonderful. I love the matte finish of egg tempera and gold leaf in combo. Super cool.